When my partner, Barbara, first opened an account on Facebook, she used it in a way that most people in Yankeedom use it. Her network was an eclectic assortment of family, current and former workmates, new and old friends, neighbors and relatives living in other parts of the country. Most of what was posted on this account were pictures of kids, dogs and kitty cats, vacations, dinner outings, jokes – nothing too controversial. Like most members of Yankeedom, religion and politics were off limits. However, there was a kind of politically unconscious assumption operating that liberal values prevailed and that somehow the Democratic Party embodied those values. I nicknamed her Facebook account the “Suzy Cream Cheese” account after the Mothers of Invention’s album because it only dealt with surface preoccupations. As the most recent US presidential primaries heated up and people took sides about Hillary, Bernie and Jill Stein, the Suzy Cream Cheese page started to be “not nice”. The political unconscious became conscious. The assumption was that all women – in the name of feminism – should vote for Hillary. My partner thought this was a very shallow understanding of feminism and posted an article she wrote that was published in a number of online radical newsletters titled, “Feminism is Bigger Than Gender: Why I’ll Be Happy in Hell Without Hillary.” Oh dear. After she posted that article on Facebook, she got the cold shoulder and lost a couple of friends. Around that time she opened up a second “political” Facebook account and started adding to it a whole new group of far-left friends and acquaintances. She continued posting “suitable for family viewing” comments with her Suzy Cream Cheese account while posting and responding to socialist and communist posts on her political account. Neither Barbara nor I are sociologists of social media or specifically of Facebook, so what follows is experiential. However, we do know a thing or two about how capitalist institutions operate in general and Facebook is no exception. The primary purpose of Facebook is to sell ad space to marketers. But how do you reach the Yankee public? You make it easy for Yankees to set up individual accounts so that Yankees can do what we do best—talk about the micro world of family, dogs and friends. In the process, hopefully people will purchase some of the products or services touted in the ads. Facebook has also made it possible for individuals to join groups and set up pages that then allow them to place ads to publicize their group or organization. For Facebook, reading groups, hobbies and support groups are fine. But Facebook has encountered a problem that many other capitalist institutions have. The problem is that you can set up the conditions for selling your products, but you can’t control people’s motivation for buying the product, (joining a group or setting up a political page) or what they will do with the product (what kind of group they will form). Facebook could even tolerate political groups. But the political imagination of Facebook consists of Republicans and Democrats. What Facebook had not counted on is the proliferation of political groups that exist outside both parties. As most of you know, there are many anarchist groups, Leninist groups, social democrats and even council communist groups. On the right there are all sorts of nationalist and fascists groups. It is safe to say that Facebook, as a capitalist institution, does not want to host these groups but until recently has not been able to do anything about it. Six years ago Barbara and I co-founded an organization called Planning Beyond Capitalism. The name pretty much says what we are up to. As an anti-establishment organization our main problem was, and still is, outreach. We stumbled and bumbled our way with the help of some anti-establishment social media whizzes who convinced us we could reach a lot more people through placing ads on Facebook. Facebook calls it “boosting”. At first, we were skeptical because the language used in placing an ad on Facebook seemed to have nothing to do with politics. They were ads for businesses. They encouraged us to “pick the right brand” and “target our audience” for best “market return”. We weren’t a business and we weren’t a non-profit. The best category we could find was “community organization”. One of the things we do on Planning Beyond Capitalism is to select one article from a left-wing news source and write one post and commentary each day. We call this “Capitalist News Interpreted”. We publish these posts daily on Facebook, but don’t “boost” them. But every couple of months or so we write a longer article, in which we make an analysis of world events, mostly in the United States, from the perspective of our organization. We put these in the category of Perspectives. Over the course of two or three years we found four or five political newsletters in which to publish our perspectives. In addition, we decided to “boost” those perspectives on Facebook. Our pattern was to boost our perspective for one week for the cost of $30.00 to run for one week. This money came out of our own pockets. We were able to select our demographics – age, gender, interests – and we could post it to almost any country in the world. In selecting our audiences when we first started boosting our posts, the choices of “anarchism” and “socialism” were available for us to select. Typically, in a single week we reached about ten thousand people – with a ratio of people in that audience of people who “liked” our perspective from about 20% to 33%. The number of “shares” in a week ranged from 75 to about 250 depending on the article. In the process of doing this, we began hearing from people in other parts of the world. Some of those people then began to write for us. Things began to change for us on Facebook when I published an article on April 1st of this year claiming the Democratic Party was worse than the Republican Party for 90% of the population. After we posted a link to it on our Facebook page we tried to boost it. Facebook rejected our ad and we contested that rejection. They said it was sensationalistic, involved hate speech and promoted violence. We contested this rejection and after two arguments from us, won our appeal. We ran the ad for two weeks because of its popularity. It reached 38,000 people, had many hundreds of shares and we gained about 100 new followers. The next article we published was written by an Iraqi comrade of ours living as a citizen in Russia. The article was about why Russians are upset with Americans. We have been boosting posts on FB for 2 years. Every single one of them has political content. Why is this particular one being singled out? However, this is the first article that we’ve published about Russia, written by someone living in Russia. We believe that you are not authorizing this ad because it is a favorable account of the Russian people, which does not conform to the Democratic Party’s anti-Russian ideology. This article was written by a Russian citizen and is written from his own observations and viewpoint. Furthermore, his sources are documented and it is neither sensationalistic nor violent. We are not advocating for Russian foreign policy. We are talking about average Russian citizens. If you read the article, you would see that your response is exactly the reasons Russians are upset with Americans. Their experiences are suppressed, while we maintain the stereotypes of them as in the cartoon image that leads the article. This, to us, constitutes blatant discrimination. All this – simply to place a political ad. Doesn’t this sound like we are registering to be investigated by the FBI or CIA? Oh, no that’s just left wing paranoia. Further, they said it would take up to six weeks to verify this and to approve our ad. But not to worry, they would delete all our information once it checked out. To paraphrase an old country tune, “Take this job and shove it”, we told Facebook to “take your political registration and shove it”. No, there is no “Iron Curtain” in the US. That is for Russians. We think it is reasonable to suspect that Facebook wants to get rid of its “political underground”, the groups that exist beyond the two party system. Why? For one thing people at both extremes of the political spectrum are likely to buy the products that are advertised on their pages. The second reason is that our ads are chump change for them. Getting rid of us will cost them close to nothing in revenue. The third reason is political. Facebook, like most media institutions, is committed to the Democratic Party. Cleaning its house of “Fake News” (the news and opinions of the socialist or fascist sides of the spectrum) will steer people back to reasonable choices like the Democratic Party. It is our belief that this change in policy requiring organizations like ours to register as political groups has occurred in 2018, in part, because this is an election year. There are other indicators Facebook is closing ranks. In selecting an audience for our article, we noticed the choices given under political interests on the left, the furthest left available to choose was “very liberal”. There was no socialist choice even though a self-proclaimed socialist ran as a Democratic in the 2016 primaries. If anyone reading this has recommendations for alternatives to Facebook that would allow us to place political ads to broaden our reach, please contact us. 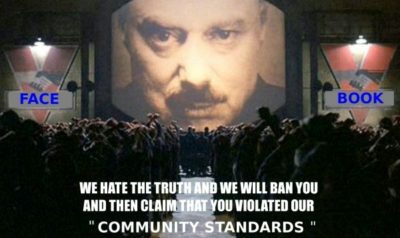 It’s time for those of us on the far left to find an alternative to Big Brother Facebook. Bruce Lerro has taught for 25 years as an adjunct college professor of psychology at Golden Gate University, Dominican University and Diablo Valley College in the San Francisco Bay Area. He has applied a Vygotskian socio-historical perspective to his three books found on Amazon. Read other articles by Bruce, or visit Bruce's website. This article was posted on Saturday, June 16th, 2018 at 3:01am and is filed under Capitalism, Censorship, CIA, Democrats, FBI, Hypocrisy, Internet, Media Bias, Propaganda, Social media.